Isobar Asia Pacific agencies had a historic week last week at the Campaign Asia Agency of the Year Awards, picking up a total of ten Agency of the Year awards and Digital Network of the Year for the fourth time in the past five years. Isobar won more Agency of the Year awards than any other agency. 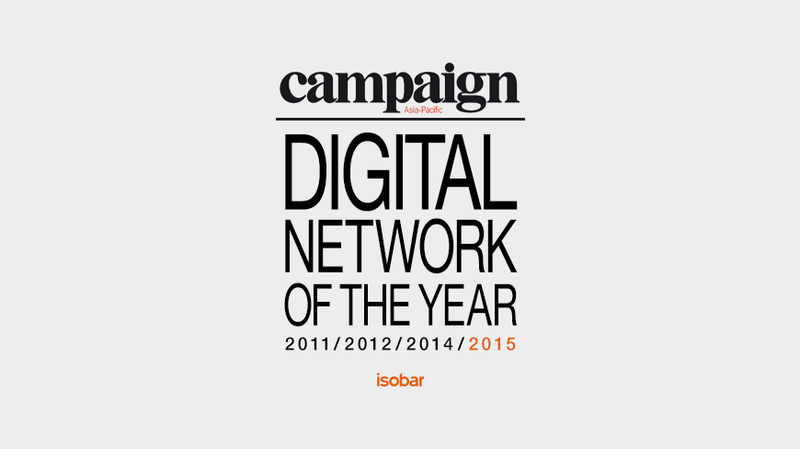 Isobar China Group were crowned China Digital Agency of the Year, and Greater China Digital Agency of the Year. Verawom Linked by Isobar were recognised as China Specialist Agency of the Year, with Isobar Hong Kong and Isobar Taiwan both winning Gold in their market Agency of the Year categories. Isobar Malaysia also won Gold, Malaysia Digital Agency of the Year, with our Singapore team narrowly missing out on the top prize, but came away with Bronze, Singapore Agency of the Year. Earlier in the week, Isobar Japan scooped up Gold, Japan Digital Agency of the Year and won Japan / Korea Digital Agency of the Year, with our Indian team also picking up Gold, India Digital Agency of the Year as well as Winner, South Asia Agency of the Year.